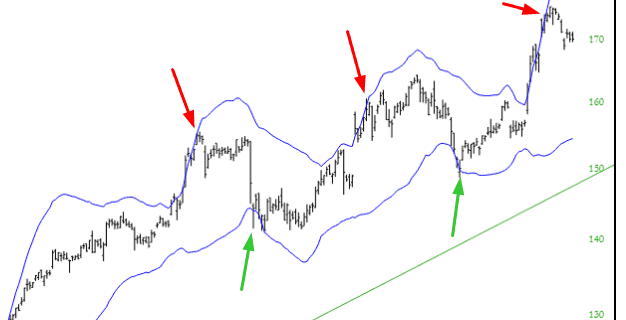 Bollinger Bands taking the concept of moving averages out another level. This overlay uses a simple moving average as its basis, flanking it with a pair of bands, one above and one below, that are two standard deviations away from the middle. Graphically, this creates a stock that is “bound’ by a set of bands and tends to confine the price action within those boundaries. Prices tend to “bounce” off these bands, as they represent powerful levels of support and resistance. This is not to say that prices never get outside of the bands. When they do, however, these tend to represent price extremes. The width of the bands will also vary depending on the volatility of the financial instrument being track. Wide bands whose distance stays fairly regular indicates a smoothly-trending instrument. Bands that are widening or contracting, however, indicate that the underlying instrument is doing the same (that is, becoming more or less volatile). 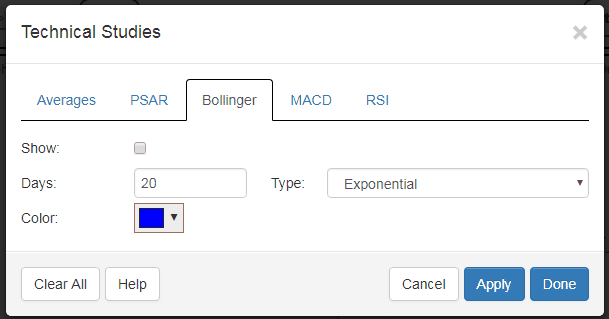 The dialog box controlling Bollinger allows you to change the days used as the basis for the moving average (whose default is 20) and whether or not the calculation is exponential (more emphasis on recent price activity) or simple. You can also alter the color used for the bands. 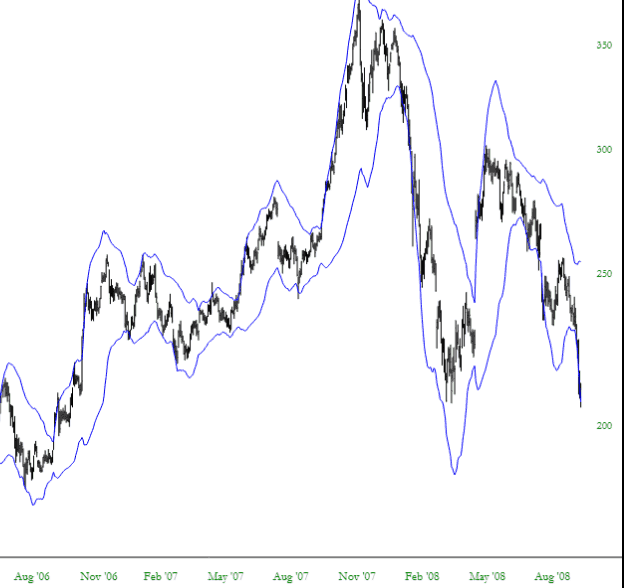 At its most effective, Bollinger Bands can be a helpful guide in spotting extremes of support and resistance, particularly when the broad movement of a financial instrument is trending well.